Already in 1903, Kelly went to Germany as a music student, and would be there on and off. It was in Frankfurt at a café he read the article about his old rival, Lou F. Scholes, and the Olympic rowing in Henley at the end of July 1908. Kelly would not get his revenge as the Canadian was beaten in his first heat, and Kelly would not be picked to represent Great Britain in the single scull. Instead he was asked by Leander’s coach, ‘Tarka’ Gold, to train and race in the club’s eight, which was going to be Britain’s second boat in the Olympic eights; the first eight was from Cambridge. From 18 June, on a daily basis, Kelly wrote down in his diary the laborious training he and his fellow oarsmen in the eight went through. 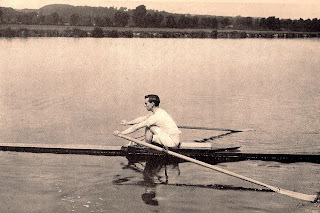 The ‘old men’ of Leander – two others were Guy Nickalls and R. B. Etherington-Smith - won the Olympic gold in the eights, giving Kelly another medal to his collection. 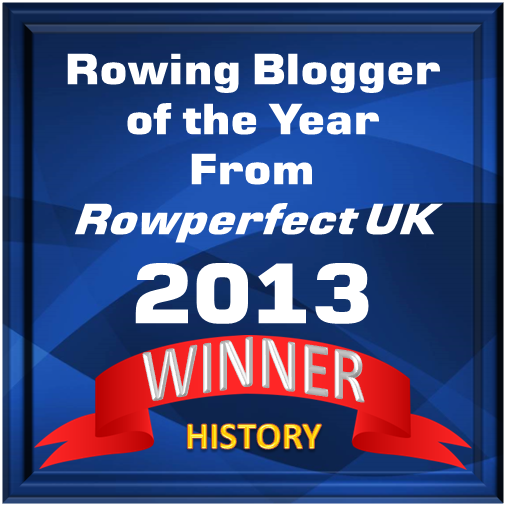 The Olympic champion race would be Kelly’s last rowing race. A couple of weeks after the Olympic rowing, an important printed work on rowing saw the light of day, The Complete Oarsman by R. C. Lehmann, who was a Liberal MP, a contributor to Punch, a poet, and an authority on rowing. The book also has chapters written by other authorities of the sport. 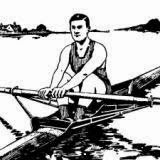 The section on sculling was written by, as Lehmann elegantly put it, ‘Mr. 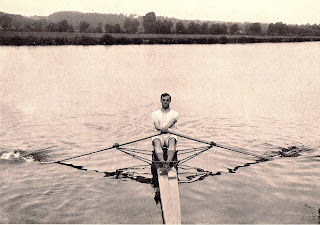 F. S. Kelly, the master of the art.’ Even if this chapter was written 100 years ago, there are still some highly valuable pointers about sculling technique for today’s scullers. Kelly’s chapter was illustrated with twelve black & white photographs of the author in his shell. Brooke did not reach the Dardanelles. En route, he contracted septicaemia after a mosquito bite and died on 23 April 1915. He was buried on the Greek island of Skyros with his friends Kelly and Browne present. Both Kelly and Browne were wounded at the ill-fated campaign at Gallipoli. While recuperating, Kelly wrote the Elegy for string orchestra in memory of Brooke. Although not fully well, Browne rejoined his unit and was fatally wounded at the Third Battle at Krithia on 4 June 1915. His body was never found. Kelly returned to Gallipoli in July and was among the last soldiers to be evacuated off the Gallipoli Peninsula. He was awarded the Distinguished Service Cross for ‘conspicuous gallantry’ at Gallipoli. The Hood Battalion was shipped to France in May 1916. At the end of the great Battle of the Somme, Kelly was killed on 13 November, age 35, while leading an attack against enemy lines at Beaucourt-sur-Ancre. Frederick Septimus Kelly now rests in a grave at Martinsart British Cemetery, Somme. In May 1915, Kelly’s sister Maisie married Captain John Kelly (not related), whom later reached the rank of Admiral and for whom the famous destroyer, commanded by Mountbatten, was named. F. S. Kelly’s diaries, which he began to write in 1907, were bought by the National Library of Australia in 1979, and were published under the title Race Against Time – The Diaries of F.S. Kelly, selected, edited and introduced by Thérese Radic in 2004. Acknowledgement: Writing this two-piece article, a very good source of information about F.S. Kelly’s early life and his music studies has been Race Against Time – The Diaries of F.S. Kelly, which was selected, edited and introduced by Thérese Radic. Dr. Radic has very kindly allowed me to use her research for this article, for which I am immensely grateful. The beautifully decorated sculls with which F.S. Kelly won the Diamonds are at the River & Rowing Museum. Yes, these sculls, which Kelly used in the 1903 Diamonds, belongs to rowing historian (and collector) Thomas E. Weil of Connecticut. Weil's collection is now at the Mystic Seaport Museum in Connecticut, the River and Rowing Museum in Henley-on-Thames, and his private collection.